Asterisk based IP-PBXs are becoming more available and popular on the PBX business market, threatening the traditional proprietary PBX manufacturers position continuously. IP-PBX has proved itself to be efficient because it can reside on the current network using existing LAN. Besides, it can greatly lower operational costs especially for systems with a higher number of users. As an R&D based company, Reapfield Technology (Reapfield) is solely involved in developing cutting-edge innovations in areas like IP communication, wireless and mobile solutions. In 2006, Reapfield decided to develop a complete IP PBX solution to meet customers’ demands, which could seamlessly combine traditional analog telephone lines and Voice over IP (VoIP) connections together. To achieve its goals, the company needed its IP-PBX solution to perform a number of tasks, including instant messaging, teleconferencing, fax, interactive voice recording, and more. 1. Can not bear any disadvantages related to communications quality and reliability since most Reapfield systems are running on operator environments for telephony subscribers. 2. Have to match Reapfield’s custom requirements in a variety of points, including physical size, technical specifications, and interface ability. 3. Need to partner with a technology-oriented vendor to match the even-changeable requirements in evolutionary situation in the long run. Because Synway caters to these strategic requirements better than its existing vendors, Reapfield planned to evaluate one of Synway's offerings: analog interface cards FXM. 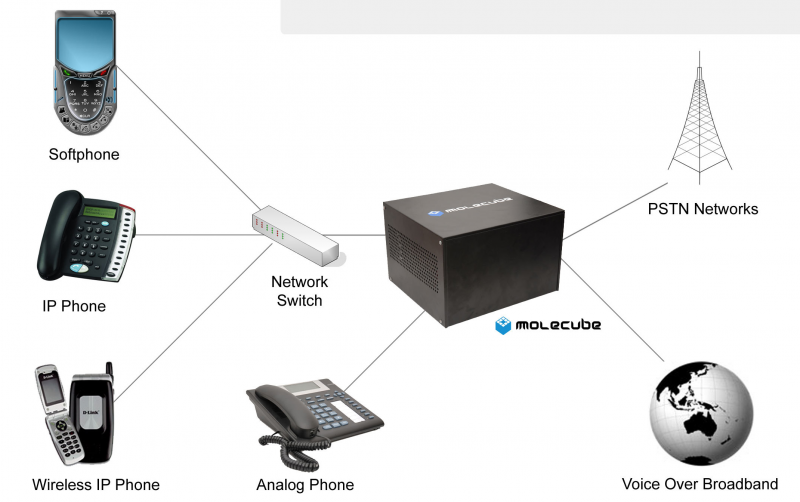 "Molecube, the IP PBX based on open source and next generation network technology, delivers unparalleled features to the world," said Celestine Amoako-Boateng, the Business Development Manager of Reapfield, "We now have the expertise to design this IP PBX, but we need open source hardware platforms with superior and cost-effective echo cancellation technology. Through the comparison of several hardware providers, we finally choose Synway as our partner to deploy Molecube." Molecube IP PBX, the next generation pure IP PBX, is a complete hybrid communication system designed based on PBX360 concept, the next generation communication system which combines the data, voice and video network all in one system. While searching the marketplace for the best Asterisk-based hardware platform, Reapfield decided to adopt Synway’s analog products FXM series. The FXM series delivers unparalleled selling points, including its rich functionality, user-friendliness and cost when compared with all competitive products. Half or full length for 2U height, its flexible architecture can perfectly suit all of new-generation server or chassis, and help developers exceed new standards. This architecture is in tune with design trends for better versatility, user-friendliness, smaller size and convenience. The FXM series leverages Synway's patent-pending echo cancellation technologies to achieve crystal audio quality for users in complex networking environments. With up to 128 ms capability, the echo cancellation is on board DSP-based and supports each channel on the full four E1, T1 and J1 lines where software echo cancellation is not sufficient or where CPU utilization has to be minimized. The echo processing capability has been field-proven by the leading carrier labs and made Synway's product offerings the most cost affective and accountable worldwide. FXM's modular architecture enables Reapfield to enjoy convenient configuration and high expandability. A single card supports from 2 to 32 channels. With rich DSP resources and advanced data processing DMA technology, the FXM minimizes the utilizations of host CPU to design versatile, high scalability open source platforms in highly demanding networking environments. The FXM series leverages SuPerFromTM to reassure superior voice quality and echo cancellation in complex networking environments. To match Reapfield feature growth, Synway is also providing a complete range of Asterisk-based hardware components and platform, including digital interface cards, Asterisk appliance and Gateway/IP-PBX systems. So any solution providers always can find the match between Synway's offerings and their needs. "We do not worry our market needs anytime when we decide to adopt Synway's hardware, it is a dynamical process, and I can exactly decide what I will deliver in three years or even longer", said Mr Jefrey Ong, CEO from Reapfield. In 2006, Reapfield first tested Synway FXM analog series cards in 8 ports and 16 ports. As Synway's API is not only full-functional, but also user-friendly, Reapfield engineers took only a few days to build the whole systems basing on Synway hardware platforms. During the migration stage, Synway's engineers offered highly responsible technical support to accelerate debugging and development. Later, to cater to Reapfield customers' special requirements, Synway developed new generation FXM series to fit to Malaysia network environment. The features include adjustable echo cancellation capabilities to improve voice quality. In 2008, when Molecube basing on Synway FXM series owned good reputation in Malaysia, Reapfield found another market opportunity that a great majority of medium/large enterprises were using the digital network, so they naturally made decision to integrate Synway TEJ digital telephony cards into Molecube. With one trunk (E1/T1/J1) per card, Synway TEJ 1A support up to 120 voice calls in single system. As all Synway hardware basing on the same driver, and Synway's engineers offering satisfactory support, Reapfield made the upgradability of Molecube seamlessly and effortlessly. After a successful trial, Molecube IP-PBX runs successfully on Synway FXM and TEJ series hardware platform, which helps Reapfield won many customers across various sectors. Molecube improves company’s efficiency by investing in feature-rich and low cost IP-PBXs. Using Molecube, customers can easily manage the entire office telephone network from any web browser, and can move this IP PBX to another place conveniently because it is light and easy to deploy. Basing on Synway open-source hardware platforms, Molecube improves customer satisfaction rate for operators. Since our inception in 2005 as an IT Research and Development company, ReapField Technology Sdn. Bhd. has being solely involved in developing cutting-edge innovations in the area of next generation IP communication, wireless and mobile solutions for telecommunication service provider and end-users alike. Reapfield Technology has achieved several significant milestones in her journey, amongst which includes being awarded the MSC status in June 2006 and Malaysian Communications and Multimedia Commission (MCMC) licensing in 2008. Over the years, our area of expertise in designing customized IP telephony solutions to specific customer needs, has enabled us to acquire expertise in giving high level consultation for corporate bodies in all areas related to telecommunication.